I see social media myths everywhere: on Reddit, in Slack groups, even on the big networks. It’s hard to discount some of the stories because we have so many variables at play. The Algorithm shoulders much of the blame here because sometimes the creators don’t even know how it all works. So, you might hear scheduling posts will destroy your organic reach. This means you stay awake all night just so you can send that post at the right time. Eventually, you hear that it isn’t true. We need to find a way to separate the myths, claims, stories, and suppositions from the best practices and useful advice. So, I am going run the tests on your behalf to see if we can find the best social media tips that aren’t fake and debunk the myths that make you nervous. This month it’s all about Twitter and their fight against the 500,000 bots they block daily and how this is impacting things on the platform. I saw this quite a bit this month: retweet yourself and double your impressions and engagements. It was really popular among “shadowbanees” who were not getting the impressions they were accustomed to. It was easily one of my favorite secret tips of the month because it is so polarizing: faux pas or pas mal? This is not just one of those shadowy tips, but it is one of the more controversial. Some people have argued passionately for it. Twitter is amazingly complicated; tweets have a shelf life of a minute, but you need to constantly tweet. We also know that repeating tweets can be problematic, so you need variety in your tweets. When one of these tweets performs well, then you can really get jammed up because you know people will like it, but many people missed it and you can’t re-publish it. Retweeting yourself makes sense, right? Well, you know a lot of people will mock you for indulging in this kind of trumpeting. Twitter can be a scary place, and people generally see self-retweeting and liking as a sign of desperation and narcissism. There is some latitude given when retweeting yourself. You’ve just gotta earn it first. But these are company channels, so why not experiment a little? Usually, I wouldn’t take social media tips from randoms on Twitter, but I decided I was willing to risk the company to look a little socially awkward in this case. If retweeting yourself will double your retweets, impressions, and all those other little measures we love so much, then I would consider it one of my best social media tips. If the theory is correct, every tweet I retweet will receive a boost in impressions and engagement. Obviously, the benefits will be an exponential thing with more popular tweets enjoying a bigger jump, but this will also be an effective strategy for the less popular tweets too. The bump will be large enough to incorporate it as a regular practice in the future. I am going to pick the best performing and worst performing tweets and then retweet them. In some instances, I will quote them, and in others, it will be a standard retweet. I am also going to select older tweets and retweet them. 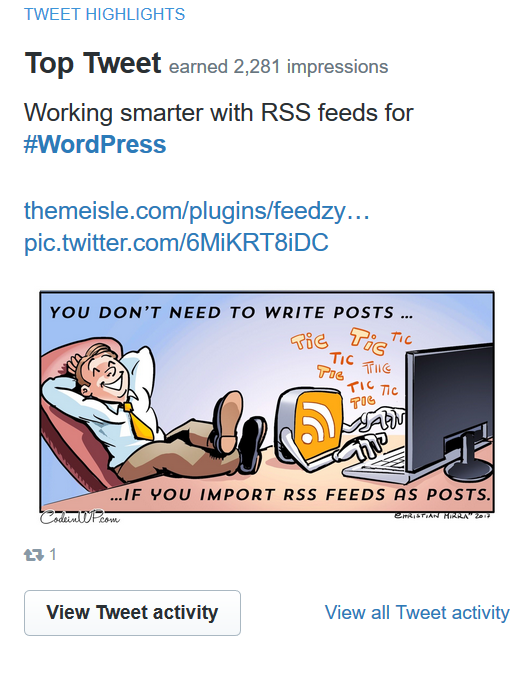 I started off with a quoted retweet from our monthly WordPress news article. My quoted retweet for the monthly news got a slight impression boost. It got in front of 147 more people but performed much worse than the original in terms of actual engagement. 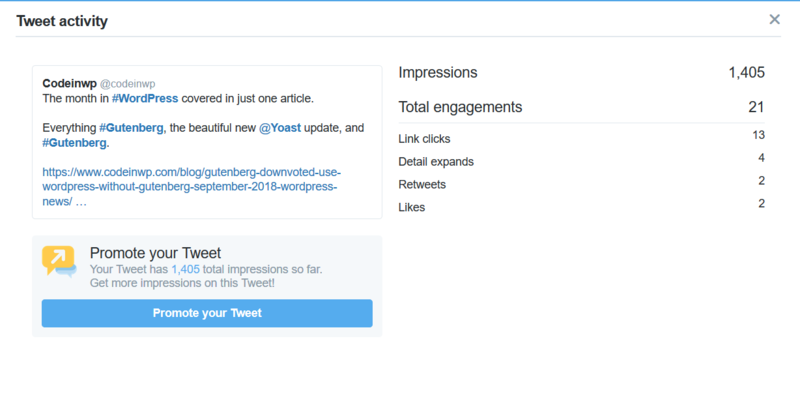 The original tweet leaned into Yoast’s popularity and the growing concerns about Gutenberg for WordPress. This is the result of the retweet with a quote. I removed the Yoast mention but retained the hashtag. There was a slight boost to the impressions but the dip in engagements counteracts it. This is not just a problem from retweeting but the removal of the mention. Yoast engaged with the original tweet, so it gave a little bump. I also tried a straight retweet of an underperforming post. This is a more interesting tweet because it doesn’t really glom onto anything external, apart from WordPress. The results here are fascinating. This second post had no engagement, you can see the narcissist-tweet from me in the box. No one liked it, no one retweeted it, yet it got more impressions than the news retweet above. You can see in the details that nothing interesting happened with only 2 genuine engagements. 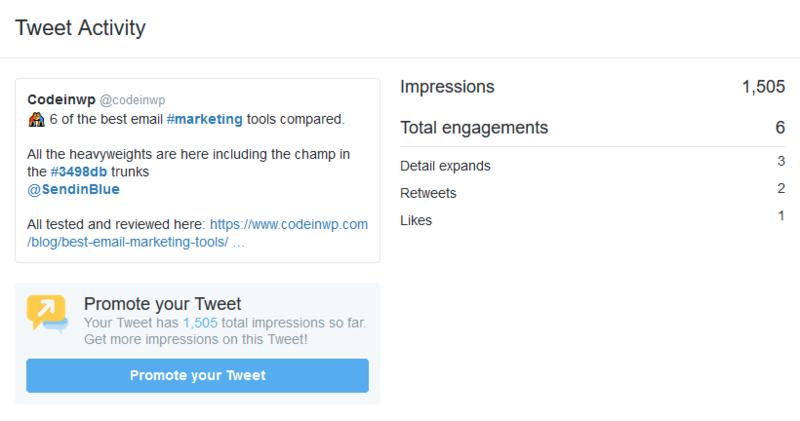 Check out how well it performed, impressions wise, compared to a regular tweet. The retweet was never popular, and the engagement rate is almost unmeasurable but somehow it has almost eclipsed a tweet with a good engagement rate. I decided to try this with another, let’s say unloved, tweet on a different account. As you can see there was nothing doing with the original tweet. It seemed a worthy tweet for the experiment. 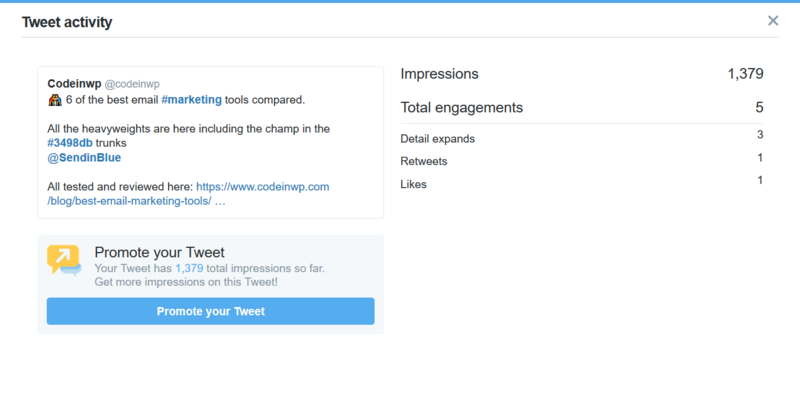 The retweet led to twice the amount of impressions with 3 times the engagement (taking the retweet out of the number). The numbers are still low, but there was a significant uptick. I saw this really pay dividends with a popular post. A retweeted Hansel and Gretel post doubled in impressions and engagements. So, it seems pretty simple, right? Find the best tweets and then retweet them for twice the impressions and engagements. Actually, it is not always that simple. I have a decent enough tweet here which reached around 70% of our followers with an engagement rate of ~0.88%. When I blast it, I am going to see something amazing right? I am going to viral, right? I’ll start a YouTube channel, and become a star. Eh. Maybe put the Lambo on hold for a few months or so. Once again, I am the lone retweeter. We got a little bump in both impressions and engagement rate (0.94%) but I was a little disappointed. The theory that all retweets would enjoy a double bump didn’t hold here. Once again, I made no changes but I was hoping to see a nice bump for the tweet regardless. The impressions hobbled to just 1575 which is a gain of 78. The engagements are not that much better; we get just 2 extra link clicks. I should be happy that the engagement rate is now over 1% but at what cost? Finally, I decided to put it to the test with a different content type. Link tweets are the unfortunate tweets of the Twitterverse. Generally, they are not too special but they are kind of necessary. I picked a popular tweet that leaned heavily into a broad hashtag, Marketing, and included a mention for SendinBlue. You can see that the impressions are lower than 50% and the engagement rate is sputtering at 0.36%. On the bright side, we saw an unpopular tweet double its performance after a retweet. So, I head into this one with confidence. This is the first time I have seen the engagement rate drop following the retweet. 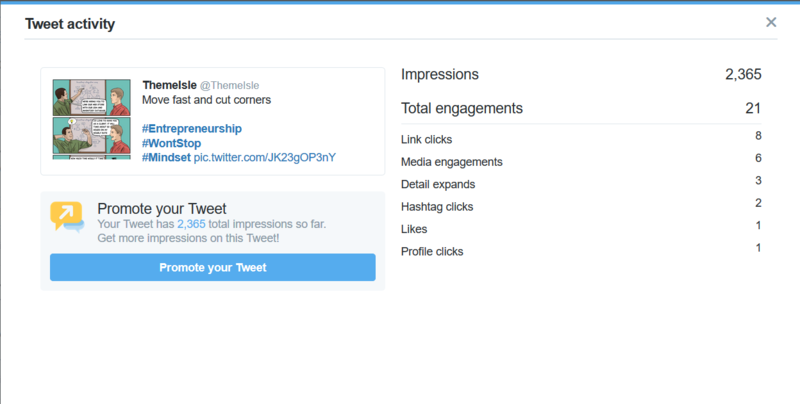 When you take my original tweet out of the calculations the new engagement rate is 0.33 from an extra 126 impressions. The verdict: Social media myth or not? So, it is true that I saw a bump every time I retweeted myself, but I really wanted a leap. In some cases, I saw over a 100% increase in the impressions, but in other cases, I saw ~10% increases. When it comes to engagement I saw a worse performance with just an additional retweet, or view, in some cases. While this might mean a 100% increase it’s not much when I moved from 1 to 2. The bump was not at all exponential. The rate of increase was lower the more popular the tweet. I also found that I was never able to reliably double anything (except the tweets themselves). The increases were, across the board, inconsistent. If you retweet, you will see more impressions, this is how the system works, but is it worth it? The only retweets that met the conditions of the myth were those that had performed poorly, and their performance was not significantly better on the retweet. I think it is more valuable to ditch them and find something more interesting to tweet. Myth busted. It’s one of the social media tactics that will work in some cases but shouldn’t be part of your ongoing strategy. Do you know any social media myths you’d like us to look into next? Let us know in the comments! The post Retweeting Yourself Doubles Your Reach … Or Not? (Social Media Myths) appeared first on Revive Social.